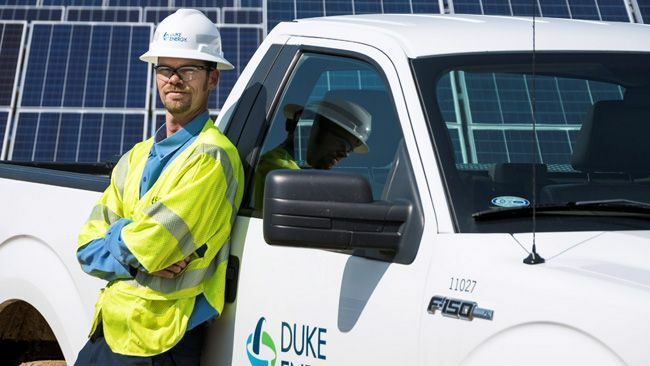 CHARLOTTE, N.C. -- Duke Energy today proposed a $62 million solar rebate program designed to help its North Carolina customers with the upfront cost of installing solar panels on their property. This is the first of three customer programs Duke Energy is proposing as part of the implementation of 2017's Competitive Energy Solutions for North Carolina law – also known as House Bill 589. "The Competitive Energy Solutions law for North Carolina will reduce the cost our customers pay for solar, while also supporting their interest in solar energy in ways that are most meaningful for them," said David Fountain, Duke Energy's North Carolina president. "For many customers, installing solar is a significant investment. Duke Energy's rebate program will help them by lowering their initial costs." Currently, in North Carolina, Duke Energy has about 6,000 customers who have private solar systems – with a total capacity of just over 50 megawatts. The program expects to increase North Carolina's private solar market by 200 percent over the next five years, providing an economic boost for the state's solar installation business as well. "The proposed solar rebates program is the result of two years of collaboration between the N.C. Sustainable Energy Association and Duke Energy," said Ivan Urlaub, NCSEA's executive director. "If approved, this program will enable more North Carolinians across our state to realize the cost-saving benefits of solar. We are glad to have been a voice for electric consumers in the design of this program. NCSEA looks forward to partnering with all energy providers and their customers to continue innovating solutions that open our growing clean energy market to everyone." The program needs to be approved by the N.C. Utilities Commission. "We are structuring our program to give customers more flexibility on how to adopt solar resources," added Fountain. "Of course, customers have to determine if solar energy fits their needs." These programs continue the company's efforts to implement the Competitive Solutions for North Carolina law, the state's landmark solar legislation. Co-sponsored by state Representatives Dean Arp and John Szoka, the law was passed by the General Assembly and signed by Gov. Roy Cooper in summer 2017. Sometimes referred to as HB 589, the law calls for a major increase in solar power in the state, which is already second in the nation for overall solar power.